London’s Olympic velodrome was christened tonight with three hours of team pursuit qualification, although the results weren’t exactly what the crowd was hoping for. Great Britain qualified second to Canada and Australia in the women’s and men’s events respectively, and have some ground to make up in the gold medal finals. The women will compete again tomorrow, while the men have an excruciating three-day wait for their final on Sunday, thanks to the BBC schedule. The trio of Laura Trott, Joanna Rowsell and Wendy Houvenaghel had been inside world record pace for the first two kilometres of their ride, but faded over the last four laps. The Canadians and Australians had done the same, suggesting the eagerness to proclaim the London track as one of the fastest in the world was just a bit over the top. The fast start for the Brits had proved one thing for the new venue however; that with a full crowd in top voice, getting behind a home team, the atmosphere inside is electric. The noise went up another notch when the British men walked on to the track. Unlike the women they were never even thinking of the world record. A 3-57 minute ride here in February would have been acceptable, but in the end they dipped into 3-58 territory. “We’d have liked to have gone a little bit quicker but it was pretty much what we were hoping for,” said Ed Clancy. The Australians did go a bit quicker than that. With Jack Bobridge pulling massive turns, Britain’s great rivals (who rode after the British team, giving themselves a target) put sixth tenths of a second in to the home nation. The two nations were well ahead of everyone else as New Zealand (without Jesse Sergent) could only manage a 4-04. The biggest surprise must have been the Russians. Without a doubt the most improved team of the last year could only manage a 4-06, putting them outside the top four. Coach Heiko Salzwedel will no doubt get them back in to the form that saw them ride a 3-56 last November in time for the world champs, and their strongest riders weren’t here, but tonight proved they still have a long way to go to match Australia and Great Britain. 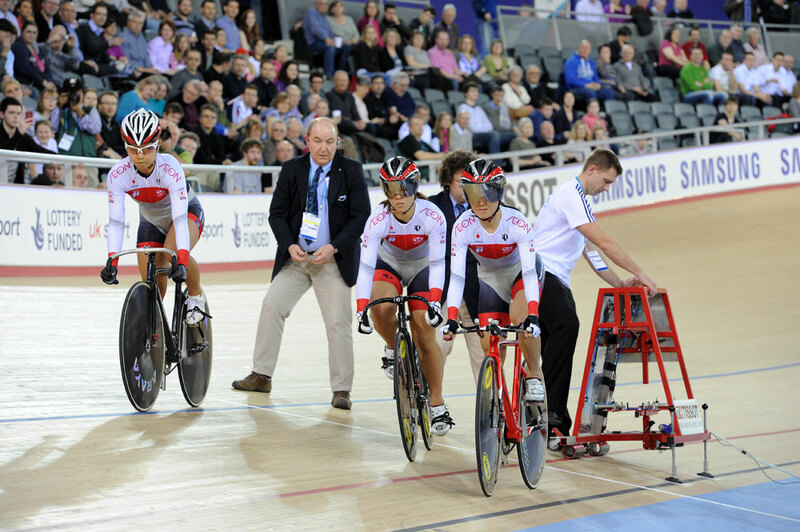 The first team to turn a competitive pedal stroke in the Olympic velodrome were the women’s Japanese team pursuit squad. It wasn’t the most spectacular debut. Two riders rode with drop handlebars and sat behind the solitary leader for the duration, eventually posting a 4-13 minute ride. It was a strange ride by a nation that boasts more velodromes than any other. The London velodrome will also be remembered by Jason Kenny, as this is where he was awarded his gold medal and rainbow jersey for the 2011 men’s individual sprint title. Kenny has been given the title after Frenchman Gregory Bauge was retroactively banned throughout last year by his federation, and the UCI annulled his results. Kenny is battling Sir Chris Hoy for the single sprint spot for the Olympics. Getting to ride in the world champions jersey may give him an extra boost.